She obtained permission from the family to identify the location or origin of the case. This previously completely healthy 8 yo girl complained of diarrhea, vomiting, and upper abdominal pain radiating to the chest, for the past 3 days. There had been an episode of syncope 3 days prior for which she had been seen by her primary care provider, but there is no information from that visit. Her exam was normal except for an irregular heart rate at 78, with BP of 100/60. Lungs were clear. There is an irregular rate. The image resolution is not ideal and it cannot be enlarged. All beats are supraventricular. This was my original interpretation, but was corrected (see below) by Andreas Roschl. There appear to be P-waves in front of every QRS, at a rate of about 150 (sinus tachycardia). The PR interval does not lengthen. There are some P-waves that do not conduct. Therefore, it is 2nd degree block Mobitz type II. Even more important is the presence of right bundle branch block, and probable left posterior fascicular block, with massive ST elevation. Correction to rhythm interpretation: sinus rhythm with short runs of PACs (i.e. atrial tachycardia). 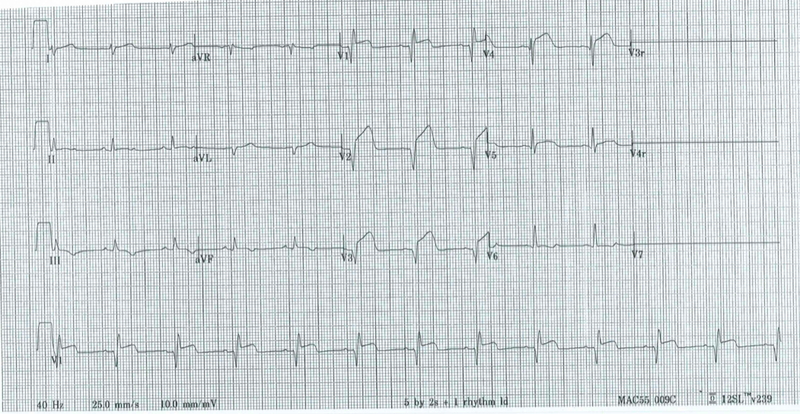 Besides AV block, this ECG is diagnostic of injury, which in an adult would almost always be a STEMI. In a child, especially one who has viral symptoms, myocarditis is highest on the differential diagnosis. Mobitz type II block has potential to evolve into complete (3rd degree) AV block. Unlike Mobitz type I (Wenckebach), it is associated with anterior injury (injury to the septum and bundle of HIS). Mobitz II block in STEMI and with new BBB is a class I indication for transvenous pacing, as it frequently progresses to complete AV block. The patient had no family history of sudden death and no recent overseas travel. There is continued Mobitz II block, variably blocked. Sinus rate remains about 150. Continued Mobitz type II block, now with a regular 2:1 AV block. RBBB and LPFB are still present. Injury pattern continues. Correction to rhythm interpretation by Andreas Roschl: What appear to be P-waves without conduction may, in fact, be T-waves. This is uncertain. Continued Mobitz type II block, still with a regular 2:1 AV block. RBBB, LPFB, and injury continue. She then had further decrease in level of consciousness en route to the referral hospital, with episodes of 3rd degree heart block with ventricular escape. She underwent transvenous pacing and was started on isoprenaline (isoproterenol). --Immediate angiography revealed normal coronary arteries. --All viral PCR tests were negative. --Echocardiogram showed severely reduced biventricular function with a septal wall motion abnormality and a small effusion. Final diagnosis: Myocarditis, likely viral, however results non conclusive for any specific viral cause. The last ECHO before discharge: mild-moderate concentric LV hypertrophy, good biventricular contractility, globally reduced LV myocardial velocities, normal conventional diastolic function. 3. Any AV block in the presence of injury or in the presence of bifascicular block is a warning of impending complete AV block. 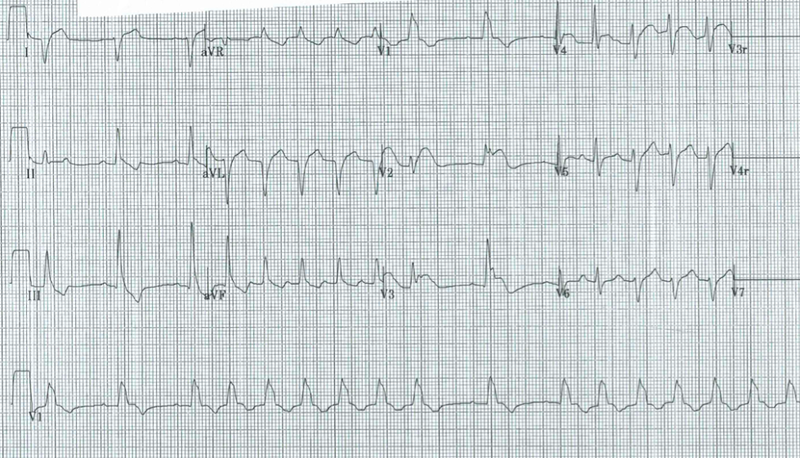 Is there some electrical alternans on the first ECG due to the pericardial effusion? Ana, there is some variability in voltage, but it does not look to me like electrical alternans. Moreover, EA is generally only seen in tamponade, not just simple effusion. Look for some good data. I'm not sure it exists. I'd be interested to know what you find. very nice case Dr. Smith. What happend finally to him? no pacemaker? As I understand, there was full recovery. My English is not very good, but i think my ECG skills ar better. For me ther is a SR with repetitive PACs = runs (1. 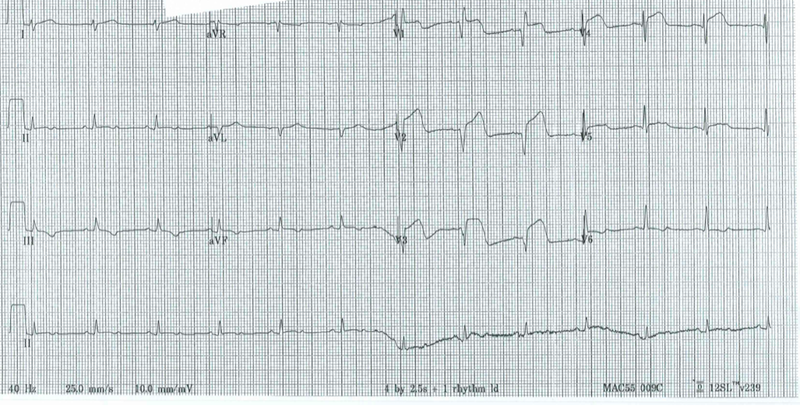 ECG); I can also see no AV- Block 2:1; the second "p"- wave is the T- wave (ECG 2). By the way: Lisinoprile in children is in Germany not allowed. Steve, thank`s for your answer. but i`m not yet satisfied. Do you believe in my rhythm interpretation of this case or do you disagree? Sorry for the delay. It took me a while to sit down and look closely again, and I think you are right about both. I will change it and give you credit for it. Any history of possible tick exposure? Ticks can carry all sorts of infectious disease ~ there is considerable evidence that some infections (e.g., Borrelia burgdorferi) cause AV block or Lyme carditis. To my knowledge, Lyme carditis affects the conduction system, but does not lead to biventricular failure. Or does it? If the diarrhea has led to dehydration what should be the first treatment to be done? 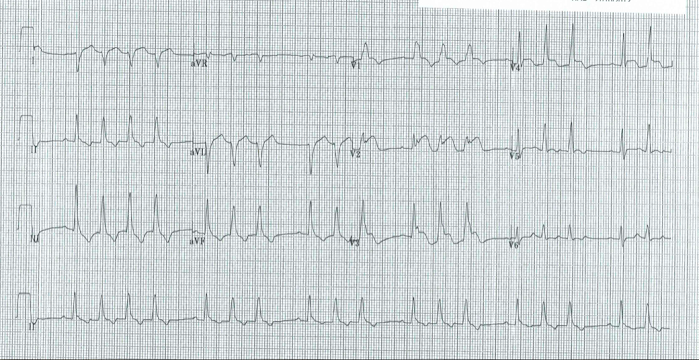 Acute Cardiogenic Shock: What is the Diagnosis? Inferior and Posterior STEMI. What else?